The 1/16” thickness is ideal to use when you are creating a structural object such as a furniture part or drawer front. 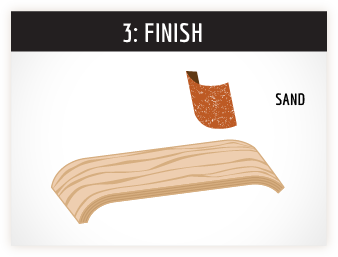 You can quickly build up thickness without using as many layers of thinner, more expensive veneer. The grains are very attractive, and can be left with maple as the finished layer. These sheets are 12 x 47 x 1/16” with the grain running in the long direction. The 1/16” thickness allows for either flat-sheet or bent-wood laminating. This thickness is ideal for vacuum pressing multiple sheets and gives your project structure and strength. Curved drawer fronts are an example of how the veneer itself becomes the structure. With the addition of a fancy veneer, it makes a complete, easy but awesome looking bending. 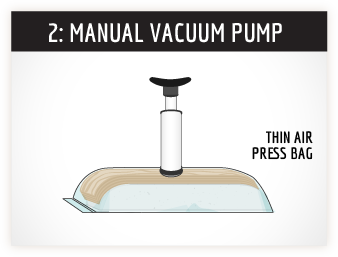 Specially suited for vacuum pressing with water-based glue, maple and birch laminate well in the Thin Air Press Kit. We also carry stock of color-infused dyed sheets to create a colorful edge profile or include as part of a marquetry pattern. 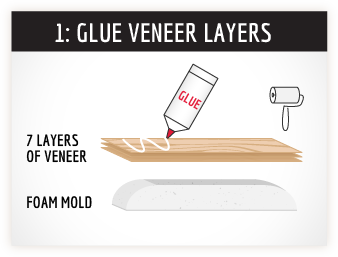 Or, instead of applying stain, use colored veneer as the top sheet. With a light sanding and clear top coat, the grain patterns show through the dye beautifully. As noted in the details area, any splits or cracks due to handling can be easily fixed. Q: What species is this birch? A: BetulaAlleghaniensis is the name. It can be yellow or white birch, all harvested in North Eastern Canada. The color refers to the bark mainly, as inside the wood is the same color for both yellow and white birch. A: Face sheets are sorted as the clearest layers for the top and bottom of your project. Core sheets are the internal layers, and will have imperfections such as small knots and holes, splits, sap lines and other color variations. Cross grain sheets (also refered to as xbands, or cross bands) have the grain running in the 90˚ direction to the other long grain layers.